Hello Everyone! Hope this post finds you all in good health and great spirit. At last the time has come for me to sit down and do the tutorial on how to draft cowl neck using basic bodice. In fact i have drafted the tutorial and its midnight and since i don't have a scanner i have to wait until tomorrow to get it scanned. So lets play a game. I would like to know as to whether this tutorial would be useful to many. You can ensure that Cowl Neck Tutorial sees the light at the end of the Tunnel someday. Better Still follow my blog so that you will get notified as & when a tutorial or technique gets posted. Please DO NOT THINK Iam forcing my blog down your throat. My blog does not even have Adsense, so i am not doing this for money. All i want is encouraging words and the comforting feeling that there are indeed people who are finding the stuff i post on my blog to useful in their life someway or the other. All you would need is a fitting basic bodice or any top pattern with waist dart in it. If it has more than one dart then please close them and include the excess in a single dart itself. French darts are also allowed in basic pattern to be used for drafting cowl neck pattern. Cowls are the folded effect creating by allowing fabric to fall from what looks like a bias triangle. Cowls look good when cut in flowy fabrics, light weight like chiffon, silk, soft knits. Cowls are either plain cowls are pleated cowls. The tutorial i will be covering will deal with plain cowls. Cowls can also be used as design element in Armhole, sleeves, skirts and even pants. I have tried them in skirts and pants and they have come out fine. Yet to try it in on sleeves, that's up on my To Do List (LONG LIST) for sometime now, hopefully will be done in near future. Though draping is an easy way to make cowls, constructing using flat pattern techniques are equally good and gives perfect Cowl. Once you have a perfect fitting beautifully draping cowl, its very easy to sew with its built-in facing. So Enjoy! Please leave some feedback, even if it is like saying 'Your Blog is Stupid' (Please for god's sake don't say that, i just gave an example, my heart would break otherwise! 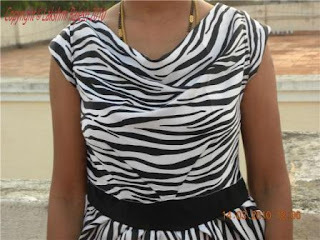 ), I would at least know what you feel about this blog and especially this tutorials as i spent almost 2 hours at least for a tutorial (drafting ones) and for sewing it is almost an entire day. It takes only a minute to give your comments and suggestions, fair enough deal isn't it....PLEASE LEAVE FEEDBACK AND COMMENTS. I am a follower of your blog. I came here by some of your posts on Craftster. I enjoy what you post very much. Unfortunately, I do not yet have a basic bodice to fit me yet, so that limits my ability to use some of your tutorials at this time. (Want to do a tutorial on how to make a fitting bodice? Better yet...want to visit my home and do one for me? Haha!) As for a cowl neck specifically...I won't use it. It doesn't suit my body type or tastes much...but by all means, please post it! I will enjoy reading it, even if I never use it, AND some day I may wish to use it for someone else rather than myself. Cheers! Though I do not leave a comment on every post, I almost read all your posts. Same as you, I love to stitch for my daughter. I will collect all drafts whether I am stitching it or not( I may use it in the future).Being self taught I would always love to learn, so I love drafts, tutorials. Iam following you, to see just what you stitch. Please keep posting. If my leaving a comment helps you continue I will surely do that. Cowl Neck Pattern Drafting Tutorial Uploaded. I will try to put up the Pattern draft i have for Basic Bodice sometime. as it is a big draft and cumbersome procedure, it will take time, but someday i will surely post it. thanks for your tutorial of cowl neck and angrakha. amazing designer outlook. i found ur blog through indusladies. I enjoy what u post. I love to stitch and designing dress. I also try different models for my daughters. yours tutorials are very useful. please post some different designer model dress. Just found your Blog. Love your designs. Hi, I really appreciate what u r doing and the hard work behind it. Few good souls like you make work easier in any field that one googles thru net to learn n enhance their talents. As I love stitching n othr hobbies too, came thru yr blog to sew an anarkali suit. well, thanks for all yr tutorials and God bless u n yr family. Keep up the good work n continue...Bye. Thanks AnNa MaRiA for your wishes. Glad my tutorials were helpful. Hi, it was wonderful reading your blog. A very true and honest effort. I appreciate the hard work. Designs are accurate, with simple representations and easy to understand. I was thinking since long, to design a neck line like this on a top..And I never got it right. Just found your blog, love your designs!